Raymarine’s AIS650 is a class B AIS transceiver allowing you to transmit your data to other AIS equipped vessels, and receive their data for viewing right on your Raymarine multifunction display’s radar or chartplotter screen. Raymarine’s new AIS650 Class B Automatic Identification (AIS) transceiver brings boaters best-in-class features and performance in a package that’s 50% smaller than previous generation AIS transceivers. The new AIS650 is engineered for seamless integration with Raymarine multifunction displays and offers multiple connection options including SeaTalkng, NMEA2000, NMEA0183 and USB. This unprecedented flexibility makes the AIS650 easy to integrate with all of your onboard electronics including MFD’s, instruments, PC based navigation systems and more. The AIS650 features a dual-channel receiver system for fast acquisition and tracking of both Class A and Class B AIS traffic. It’s also equipped with a state-of-the-art 50-channel GPS receiver with Receiver Autonomous Integrity Management (RAIM.) RAIM intelligently monitors the status and accuracy of the GPS system ensuring the vessel position transmitted by the AIS650 is of the highest level of accuracy possible. AIS650 is also fitted with a standard Secure Digital (SD) memory card slot, and AIS data recording capability. AIS650 also features both hardware and software enabled Silent Mode, which enables the captain to switch off the AIS transmitter for reasons of security or privacy. When connected to Raymarine MFD’s, silent mode can be enabled or disabled at-will from any display on the network. This feature is most often employed by tournament captains who do not want to reveal the position of their hot fishing spot, but is also vital to cruising power and sailing vessels who may want to temporarily disable broadcasting their position out of concern for vessel security. AIS650 has a dedicated set of leads than can be employed to physically switch off the AIS transmitter beyond what the software mode allows. When used with Raymarine multifunction displays, the AIS650 supports Raymarine’s exclusive Buddy Tracking feature, which allows you to save AIS targets of interest with a special icon and “friendly” name. Buddy tracking makes it easy to spot the boats of friends and family out on the water, or to identify other vessels-of-interest with ease. The AIS650 Class B AIS Transceiver is the natural choice for owners of Raymarine multifunction display products looking to increase their safety and situational awareness with AIS technology. The AIS650 is engineered for simple installation and seamless integration with Raymarine multifunction display systems. As an integral part of any vessels multifunction navigation display system, the AIS650 is backed by the same superior service and support network as the multifunction displays themselves. 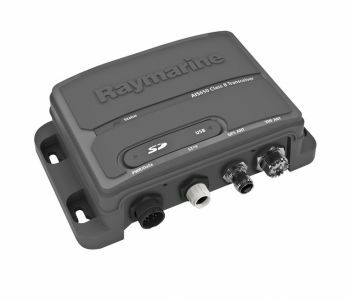 Owners can also have peace of mind with the AIS650’s standard 2-year warranty, which is upgradeable to 3-years of coverage simply by registering the product online at www.raymarine.com. •Hardware and Software selectable silent mode. •SD card slot for AIS data recording and configuration. •Front-facing LED status and diagnostic indicator. •Dual channel receiver for fast target acquisition and updating. Kogus: Vali sobiv: Raymarine AIS650 – 750.00Programmeeritud AIS650 – 775.00 Lisa toode ostukorvi.